Friends! As you know I'm currently taking some much needed mommy/baby/daddy time after the birth of our little one :) Aggg guys, we're parents!!!! So during this transition into our new season of life, I've invited some of my most beloved and dear blog friends to help me out, in the form of unique and wonderful guest posting! Today, I'm honored to have Becca of Two Places at Once take over. I’m so excited to be here sharing a post on Christina’s blog! I’ve followed her blog for a while now and I can’t get enough of her recipes. While she’s out on maternity leave, I’d love to share a recipe with y’all as well! I blog over at Two Places at Once. In my little corner of the blogosphere, I share recipes, encouraging words and little bit about my life in Texas. I’m not a native Texan, but I love learning about my new(ish) home. Now onto the recipe! 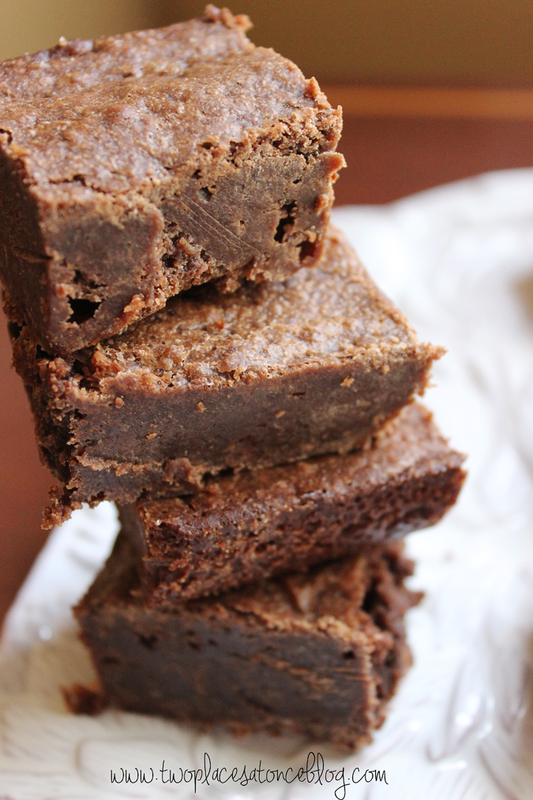 Five ingredient fudge brownies…does it get any more dangerous? A recipe this simple and this delicious must be shared. I found the original recipe on Pinch of Yum and pinned it to use on a later date. My need for the brownies came a little more quickly than I thought. Although, I guess I should have expected a chocolate craving to come around….it happens to me about twice daily. Anyway, one Friday night, my husband and I decided to do a movie night in. We ordered pizza, made popcorn and were ready to go. Our cable did not feel the same way. As soon as we tried to rent the movie, the cable went out. My husband grabbed the phone and went to call our cable provider. I, on the other hand, decided to make brownies. Not wanting to make anything too complicated, the fudge brownie recipe sounded perfect. Five ingredients? Does it get any better than that? 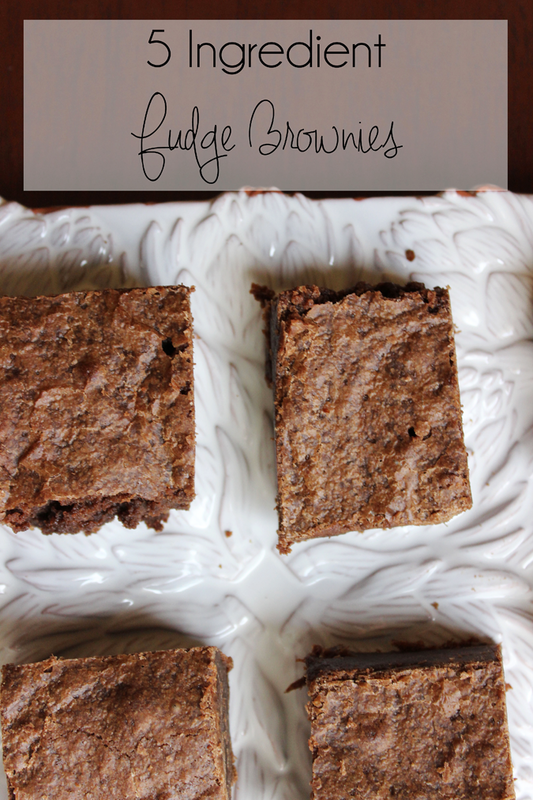 These fudge brownies will satiate any chocolate craving. I’m sure you could add cocoa powder too for an even richer chocolate flavor. 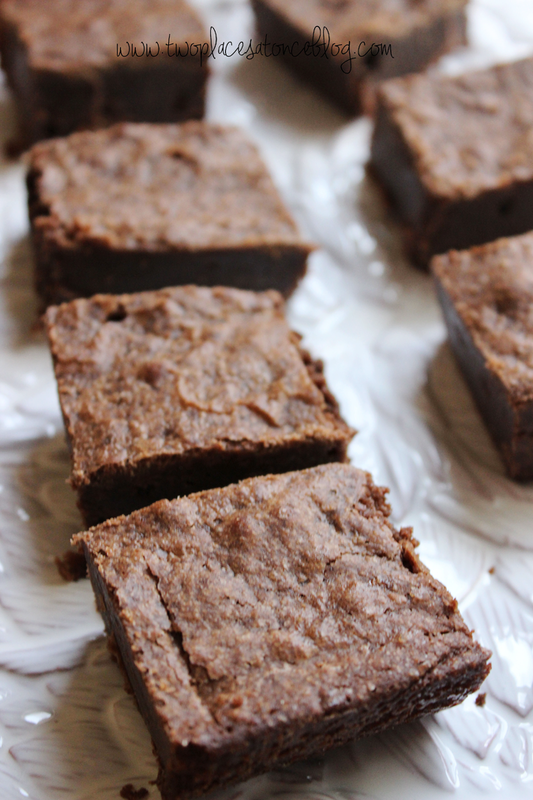 The coconut oil adds a smoothness that makes the brownies even harder to put down. The original recipe calls for cooling the brownies overnight, but I don’t have the willpower. I allowed them to cool for about 20 minute before cutting in to them. The brownies won’t be quite as fudgey, but they’re still just as chocolately. I put the rest of the brownies in the fridge overnight and they were super fudgey and even better the next day. You’ll also be happy to know that after a 45 minutes phone call with our cable provider, we were able to watch our movie. All’s well that ends well! 1. Preheat the oven to 350°F. Meanwhile, melt coconut oil and chocolate over very low heat. Once fully melted, allow to cool for 5-10 minutes. 2. In a large bowl, measure out brown sugar. Add in the chocolate mixture. Whisk in eggs until the batter thickens. Stir in flour and salt. 3. Pour the batter into a lightly greased 9x9 baking dish and bake for 30-35 minutes. Allow the brownies to cool for a few hours or overnight before cutting. Thank you so much Becca!! With my insatiable chocolate craving, these WILL BE MADE! For more delicious recipes please check out Two Places at Once! mmmmm yum! Extra yum because there are only a few ingredients! !